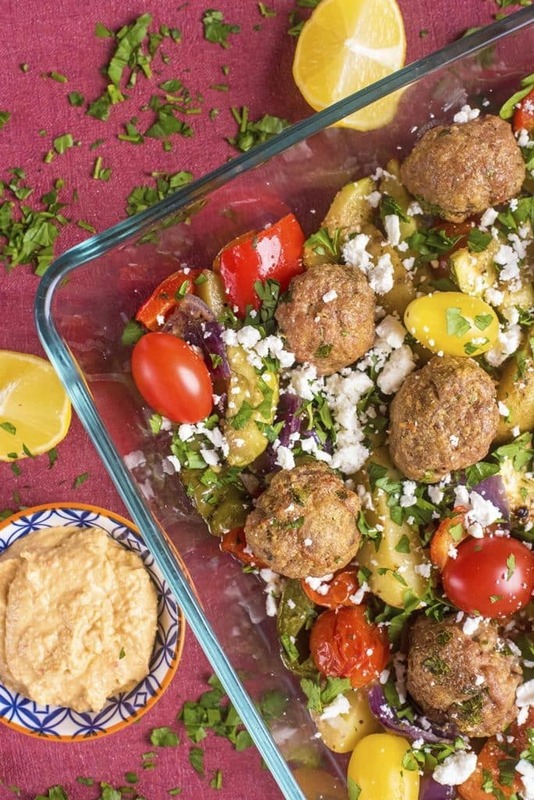 This easy Greek Lamb Traybake will transport you to a beautiful Greek island through your tastebuds – you can practically hear the lapping waves. 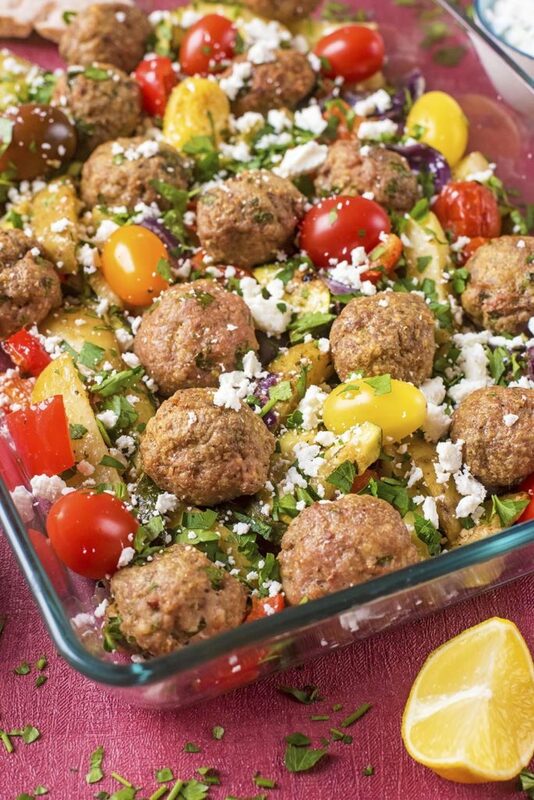 Succulent Greek lamb meatballs baked with peppers and potatoes in a zesty oregano dressing and then sprinkled with feta and mint before serving. I am a big fan of anything that all gets mixed together in one tray and goes in to the oven and cooks for the same length of time. It’s a one pan dinner and that means minimal effort for cooking, and minimal effort for cleaning up – as it’s just one pan. You are going to be seeing a lot more savoury traybakes on the blog – hands up who is happy about that? 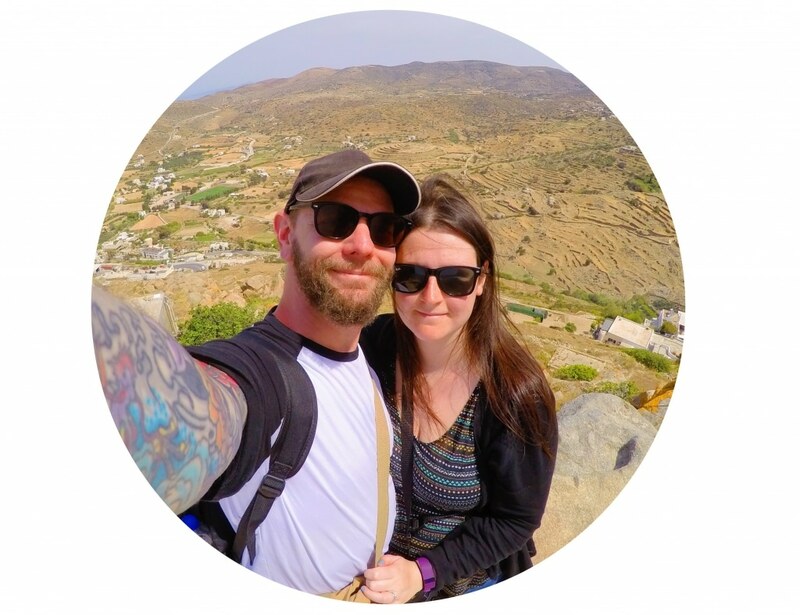 When we were island hopping around Greece, we had some incredible lamb dishes and one of my favourite was a meatball and roasted vegetable dish that was served with mountains of feta and fresh mint. Oh, and a bucket of tzatziki and a basket of pitta bread, because they were standard with every meal. This is our version of it, that has lots of added vegetables. Lamb can get a reputation of being unhealthy, but it really doesn’t have to be! 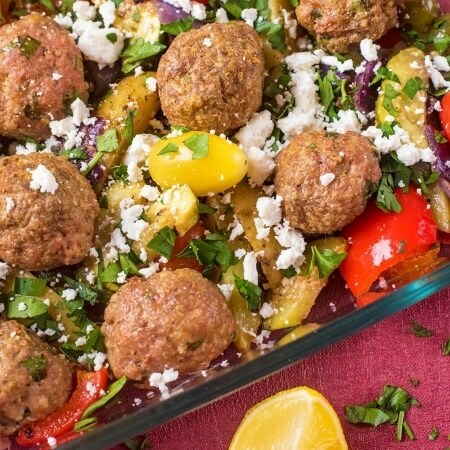 Use the leanest mince that you can find and bake the meatballs instead of frying them and you have already saved yourself some calories, but you still have all that flavour. It’s all about pairing it with fresh vegetables and that sprinkle of mint on top at the end is everything. 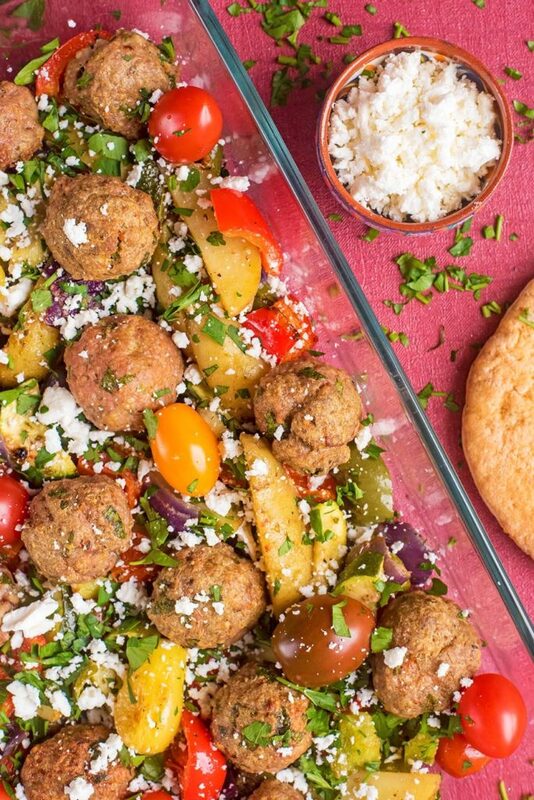 We have teamed up with Tasty Easy Lamb to show you how versatile lamb is and that not only can it be healthy, but lamb based meals don’t have to break the bank either. Don’t just think of lamb as an ingredient for special occasion or that it has to be cooked low and slow. It can be a simple weeknight meal ingredient too! Lamb is Dave’s favourite meat and he would eat it every day if he had his own way. Which is why I try and come up with lamb dishes that are packed full of vegetables, budget friendly and don’t take too long, so we can enjoy it more often. It makes for one happy husband that’s for sure. 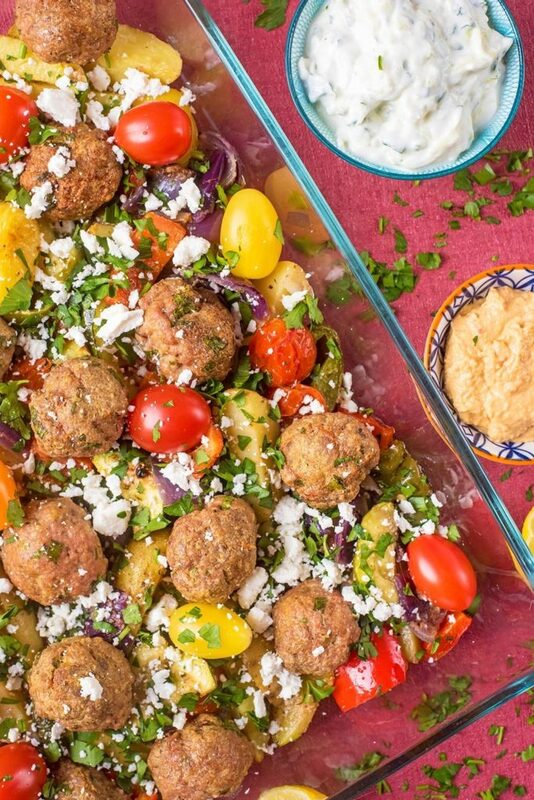 You can make all the meatballs up, and have all the vegetables pre-chopped, and then keep them in the fridge until you are ready to mix together in a dish and put them in the oven. You can freeze this dish in portions, but the meatballs can get a little dry once reheated. Therefore, we would suggest that this dish is eaten straight after cooking. You could make this with beef or pork if you don’t have/like lamb. Change up the flavours by using different seasonings. Put a Mexican twist on things by mixing some Mexican spice in to the meatballs. Use this dish as an opportunity to use up any leftover vegetables. Add some broccoli or cauliflower in, as it gets nice and crispy when roasting. A little drizzle of chilli sauce before serving add a nice bit of heat to this dish. 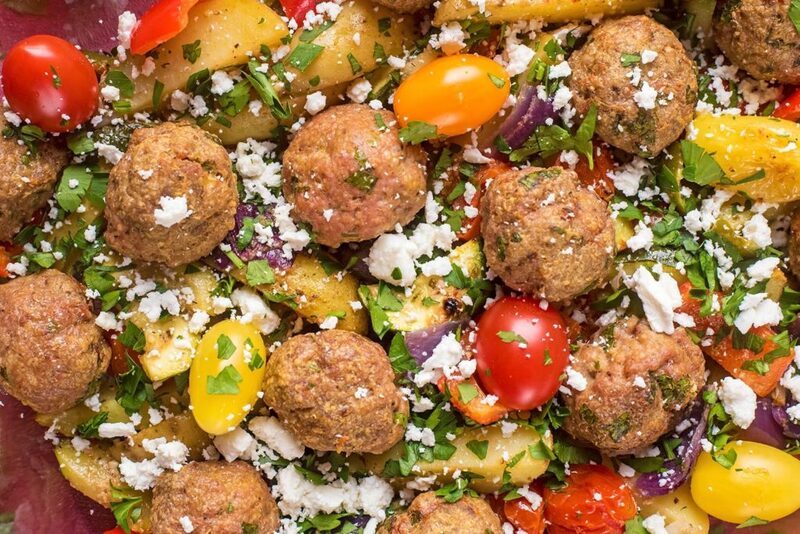 This easy Greek Lamb Traybake will transport you to a beautiful Greek island through your tastebuds - you can practically hear the lapping waves. Put all of the ingredients for the meatballs in to a bowl and mix well with your hands. Roll in to 16 meatballs and set aside. In a separate large bowl, add all the ingredients for the vegetables and mix well. Pour the vegetable mixture in to a large baking tray and then place the meatballs in any gaps. Put in a preheated oven at 200C for 40 minutes, stirring the vegetables and turning the meatballs over half way through. 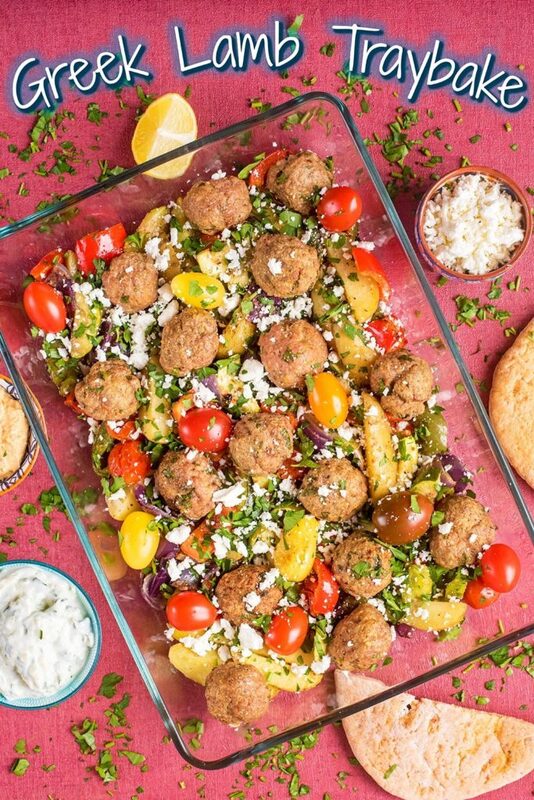 Sprinkle the feta and mint on top before serving with tzatziki and pita breads. This looks really tasty, I haven’t had lamb in a while. This roast dinner looks so good and just made me hungry. Oh, wow. This looks fabulous. I love lamb!